There is a fashion for the dancing couple in this famous reel to turn each other rather than balancing in line in turn across the set, to represent the arms of the Saltire, (St Andrew's Cross), our Nation's symbol and the Battle Dress Badge of the 51st (Highland) Division. This dance was created by Prisoners of War of the Division, which was captured at St Valéry-en-Caux on 12th June 1940. 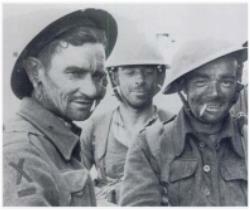 The loss of the entire Division was overlooked for many years, as perhaps, for propaganda purposes, it would have clouded the successful evacuation of the main British Expeditionary Force (BEF) from Dunkirk in May 1940. Scarcely a community in the Highlands and North East was untouched by this loss. My mother remembers 6 men from her own village of Cluny, Aberdeenshire, were lost for the duration of the War. Breaking the cross by turning with a flourish rather than balancing in line may be considered not just a flouting of tradition but somewhere approaching disrespect for a War Memorial. Let us try to maintain and restore this lovely dance and its poignant tradition. The following are the correct steps, and there follows the story of its creation. 1-8 1st couple set to each other and cast off two places [2nd couple moves up]. 1st couple meet below the 3rd couple; and lead up the middle to face 1st corners. 9-12 1st couple set to and turn first corners with the right hand finishing in a diagonal line by joining left hands with partner. 13-14 1st couple and 1st corners balance in line. 15-16 1st couple [leaving first corners in place] turn each other one and one quarter times to face second corners. 17-22 Repeat bars 9-14 with second corners. 23-24 1st couple cross over to own sides one place down. 25-32 1st, 2nd, & 3rd couples six hands round and back. Book: RSCDS Book XIII (Victory), No. 10. The 51st Highland Division were captured at St Valéry-en-Caux after fierce fighting in the Seine Maritime of France on 12th June 1940, and were eventually imprisoned at Oflag V11C Laufen, a PW (Prisoners of War) camp in Bavaria near Salzburg just across the border. Lt A P J Oliver (Peter) of the 4th Seaforths started Highland Dancing Classes. En route he was joined by Lt J E M Atkinson (Jimmy) of the 7th Battalion Argyll and Sutherland Highlanders, also captured in France on June 5, 1940*, a week, before St Valéry. The 7th and 8th Battalion of the Argylls who had also taken heavy losses in fierce engagements separate from the rest of the Division and many had managed to escape through Le Havre. Lt Atkinson was a keen country dancer and they started a reel club. On his way to the Laufen, Lt Atkinson had conceived an idea for a dance based on the Saltire, the badge of the 51st Division. The diagonal movement was merely a variation of the opening bars of "Scottish Reform," and the circle which followed it was straight out of "Hamilton House." He and Lt Oliver began to work it out on paper, helped by Lt Col Tom Harris Hunter, CO of the Royal Army Service Corps, part of the 51st Division, a past chairman of the Perth branch of the Scottish Country Dance Society, and whose wife was Secretary of the Society through the War. Having documented the dance, Lt Atkinson and Col Hunter tried to send copies home. As it was written in the shorthand used by dancers, Lt Atkinson's copy was intercepted by the German security service, the Abwehr, who spent the rest of the war trying to break the code! Col Hunter's copy made it to Scotland and his local dance group began dancing it at about the same time the PW were dancing it on the roof of the prison hospital block in Laufen. * He was not sure of the time. His watch was shot off shortly before his capture!